Kent Business School (KBS) is pleased to announce the success of a specialist training event for PhD students on research impact. 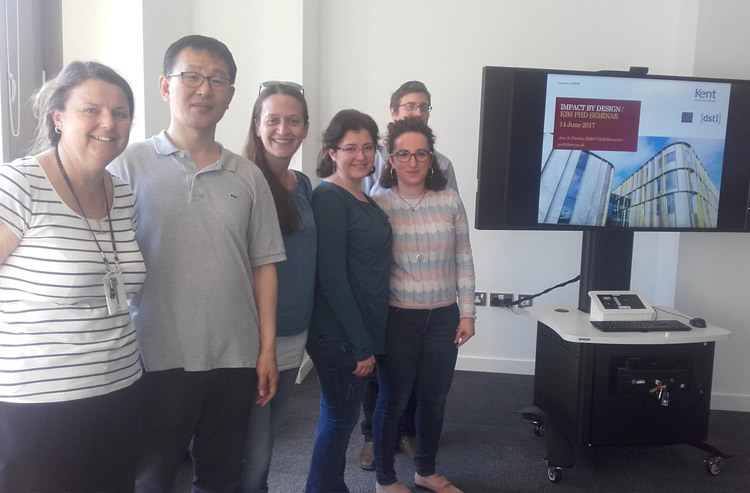 The training event, ‘Impact by Design: Training by Researchers for Researchers’, was held in June in the KBS Sibson Building. PhD students and KBS supervisors received cutting-edge advice on how researchers can generate research impact from the beginning of their careers. The session was chaired by Dr. Ekaterini Panopoulou (Reader in Finance), KBS REF coordinator and highlighted the importance of research impact for PhD students who pursue academic and non-academic careers. Ms Jane Christie (KBS ESRC CASE studentship holder collaborating with the Defence Science and Technology Laboratory) delivered a presentation that followed specialist training on impact by Professor Mark Reed (Newcastle University) of Fast Track Impact. Congratulations to the event organisers from all at Kent Business School. For further information about this event, please contact Dr. Ekaterini at A.Panopoulou@kent.ac.uk, or learn more about our PhD programmes.